Astronomie - Sind Schwarze Löcher von Wänden aus Feuer umgeben? Astronomie - Aufbau von weltweit größten Amateur-Teleskop in Utah. Astronomie - Die entfernteste Galaxie entdeckt: Galaxy von Epoche 700.000.000 Jahre nach dem Big Bang gesehen. Space tourism may not be rocket science after all. 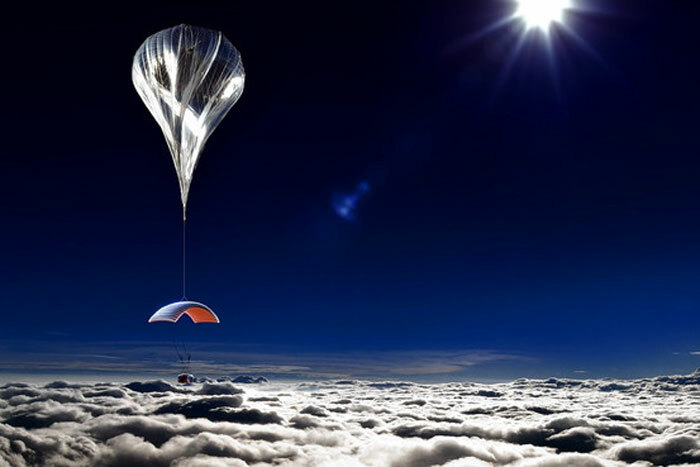 An Arizona company wants to develop high-altitude balloons to send thrill seekers to the edge of Earth's atmosphere. The trips would cost less than other proposed space jaunts, but passengers wouldn't experience the same intensity of weightlessness. Closely held Paragon Space Development Corp. of Tucson, Ariz., intends to build a helium-filled balloon, with a diameter as long as a football field, able to transport up to eight passengers to an altitude of about 100,000 feet. The aerospace contractor joins a handful of other companies that are trying to develop ways for people without extensive astronaut training to reach or at least get close to outer space. With a projected ticket price of $75,000, the goal is "bringing space to the masses as much as we can," said Taber MacCallum, Paragon's chief executive and co-founder. Revenue flights won't commence until 2016 at the earliest, while testing or regulatory complications could push that deadline out further. 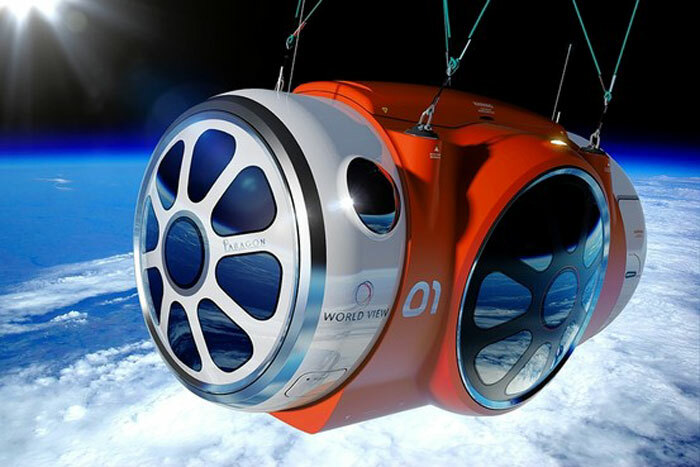 Protected by a high-tech, pressurized gondola-featuring large windows and life-support systems designed to withstand the extreme temperatures and blood-boiling conditions of a near-vacuum—ticket holders wouldn't soar as high as with other projects but still would get a panoramic view of the globe without having to wear space suits or don oxygen masks. For up to six hours, according to Paragon's submission for federal approval, passengers would be able to sit, stand and move around at their leisure and savor views of "a curved Earth with its thin blue atmosphere against the blackness of space." The vehicles would launch from Spaceport America in southern New Mexico, one of eight federally licensed launch sites. The biggest challenges involve ensuring structural reliability of the huge balloon, made of high-performance polyethylene film, and testing the capsule's flight controls. World View Enterprises, a company partly owned by Paragon and other investors, including Philippe Bourguignon, former president of Euro Disney, will operate the flights. Paragon, which supplies hardware for the International Space Station and other space programs, aims to meld largely existing technology "to really help broaden the market," said Jane Poynter, the company's chairwoman and co-founder. Tourism projects aren't tied to federally financed civilian or military programs, and they typically target well-heeled space aficionados eager to briefly experience weightlessness without the hazards of going into orbit or remaining weightless for extended periods. World View's balloon-based approach won't be marketed primarily as a way to experience weightlessness, but will rather emphasize sights like the Earth's curvature. Frequent tourist flights able to carry scientific experiments, or launch small satellites, could help spread expenses and "provide economies of scale to get to space at lower cost," said Howard McCurdy, a government policy expert at American University. "Space tourism is part of the puzzle to develop a real commercial industry." Some studies project overall space tourism revenues topping $1.5 billion by the middle of the next decade. At least six other ventures are under development, including some offering potential trips to the space station, a planned private orbiting hotel and perhaps the moon. Space Exploration Technologies Corp., the Southern California company founded by former Internet entrepreneur Elon Musk, leads the field in transporting cargo to low-earth orbit and snaring government and commercial satellite-launch contracts. But various other projects and steady progress by additional companies "point to formation of a viable industry, not just the exploits of a single high-flyer from Silicon Valley," according to Jim Muncy, an industry consultant and former House staffer. While airborne, World View's customers would be shielded from radiation and micro-meteoroids by a roughly four-ton capsule. During the approximately 30-minute return, the craft's two pilots would disconnect it from the balloon and then use an overhead parafoil, much like the adjustable curved wing of a paraglider, to control the descent and touch down on skids at a pre-arranged landing spot. Eventually, Ms. Poynter expects flights to carry only a single pilot, with backup provided by ground personnel. Purists contend that by floating about 18 miles high—an altitude reached by a few military jets and research balloons—World View technically still would remain in the atmosphere. In a September letter approving Paragon's concept, the Federal Aviation Administration pointedly steered clear of what it called "the more difficult question" of whether the project's proposed operating envelope "constitutes outer space." By contrast, Virgin Galactic, the space tourism project headed by British billionaire Sir Richard Branson, anticipates using a combination of a carrier-plane and a rocket to blast passengers 60 miles high— and provide intense minutes of weightlessness—during shorter rides. Virgin Galactic, which is already accepting reservations for $250,000 tickets, is shooting for the first passenger flight, slated to carry its chairman and other members of the Branson family, sometime next year. Congress has instructed the FAA to oversee flights of space tourists, but the agency is supposed to establish only bare-bones safety standards and then require the companies to inform passengers about the full extent of the risks they face. In the case of World View, project officials spent months trying to persuade the FAA to apply commercial-space rules rather than the tougher safety requirements that exist for traditional balloon rides. To some extent, the industry's growth will be influenced by how the FAA and the National Aeronautics and Space Administration ultimately divvy up regulatory responsibility for privately built and operated spacecraft. Some companies already are maneuvering to have the FAA's commercial-space office assert primary authority over certain projects, because in many instances NASA's long-established safety rules for manned flight are more stringent.